Photo by Ryan Somma via Flickr. I’ve been building location-based games for arts and culture institutions for five years now, first for SCVNGR and now for Green Door Labs and the Edventure Builder and often I’m asked the question: what would your perfect game be? My response is a standard post-modern disappointment: Every game is special in its own way. There’s no perfect game. The game depends on you! Everybody have a cupcake! Cop-outs, I know. But, I will tell you honestly, the reason I say those disappointing, evasive things is that my perfect game would be a complete and utter flop and I pray that nobody will ever ask me to build it. It would be an epic, disastrous game. My perfect museum game would obviously involve traveling around the world to see art, history and culture. There would have to be augmented reality, physical objects in the environment that respond to your device and, of course, internal GPS navigation. It would definitely follow a storyline with AAA art and graphics along with some costumed non-player characters and custom sculpture and clues hidden on location. There would be puzzles, lockboxes, mini-cars, hidden caverns and more cupcakes. In short, nobody would play. Visitors could only play this game if they had the time and money to play an epic adventure. They would have to learn how to use lots of complicated technology and as we all know, the more complicated the technology, the higher the chance that it will break. Considering how much they would have to pay to play it in order to recoup the enormous cost of productions…players would have unrealistically high expectations about everything going perfect in this perfect game. Photo by National Bank of Belgium via Flickr. In fact, I think what we want to dream about isn’t really the perfect game at all. We want to dream about the perfect experience. The perfect response to a game. “What would your perfect game experience look like? What would your users do?” Ah. Now that I can tell you without guilt. People would be working together, communicating, maybe meeting new people, feeling challenged, creative and capable, connecting with their cultural institution and internalizing the learning goals that we set forth. There would be many moments of fiero, which if you haven’t heard before, is that wonderful moment when humans have to raise their hands in the air and say “Huzzaaah!” because they’ve succeeded. We’ve seen it happen before: it happens at sports games all the time. It happens when people win something or solve a problem or when a character in a story prevails. But, the truth is, achieving that response will be different for every single institution. You have to know yourself, know your environment, know your audience and know your resources. There is no perfect game in a bubble. The perfect game experience is one that takes its players into account. “Murder at the Met” is a fabulous game but I do not think that it would have had the same type of success had we built the exact same game for the Boston MFA. The game is a simple web-based murder mystery. Players need to walk around the museum to discover the murderer, weapon and scene of the crime. In the end, the user experience was just where we wanted it to be: full participation, community building, connecting to the institution. The Met’s greatest resources were their incredible educators and artists, who made a very simple game into something visually gorgeous. When it was time to play, the Met’s clever educators sent out an “invitation.” NYC teens showed up in top hats with canes, suits, corsets, netted hats, monacles! Would Boston kids know where to get a top hat? Would they notice or care that the visual design is gorgeous? (This is Boston: the kids might worry about what programming language it was built in.) Can you get 200 Boston teens to an art museum in one night? Possibly…but I think I would design a different kind of game for kids in Boston. For instance, the DeCordova Sculpture Park and Museum in Lexington (just outside of Boston) ran the famed “Soundscapes” with Hallsey Burgund’s amazing Roundware, which you may have heard Nancy Proctor speak about. 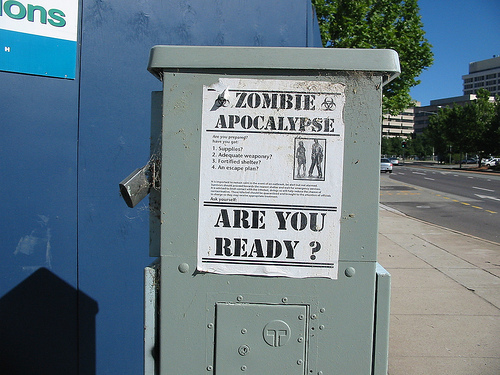 One of my all-time favorite stories is how that “Soundscapes” inadvertently created a zombie apocalypse game. Photo by Stephen Dann via Flickr. If you haven’t seen “Soundscapes” before, it was a sound installation where you can walk around the DeCordova Sculpture Park and hear different music from a mobile device depending on where you are. You can also record your responses and hear other people’s responses along with the music. Apparently, as one kid was listening to “Soundscapes” listening to other visitors reflect on the form and feeling of the art, he decided that he was going to write a story: zombies were chasing him around the sculpture park. Other kids, playing with the same device at later times heard his story and thought (naturally) that this was an awesome idea. They started also recording vignettes of being chased by zombies. On one hand, you had people reflecting on this beautiful art. 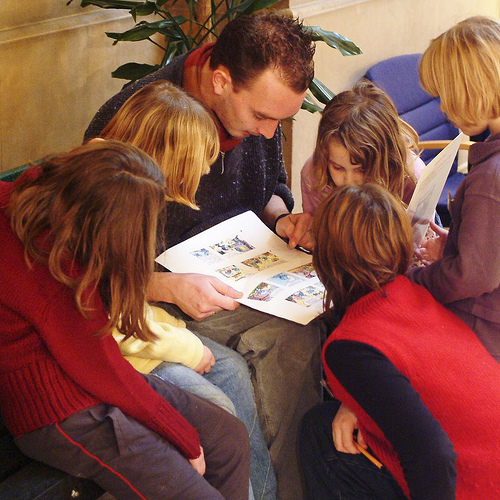 Then there was the subtext: a group of children who had never met each other, building a storyline around the art. It just happened to involve zombies. The user experience was the same result as “Murder at the Met:” full participation, community building, connecting to the institution. I’m sure there are a lot of Boston-area kids who really want to go back to the DeCordova Sculpture Park. Would this have happened in NYC? Could it have happened in Florida? The resources at the DeCordova were the space of the sculpture park and a handy donation of smartphones. But even more important probably were the uber-liberal MA parents and teachers who thought that zombie stories were a perfectly valid way for children to connect with fine art. It was the perfect game for Mass, but maybe not as perfect for other communities. My last example of a game that’s perfect for just that community would be “Ghost of a Chance” at the Smithsonian American Art Museum. This game required some committed participation—it wasn’t something you could complete in an hour at the museum or in 20 minutes on your phone. People built artifacts, they told stories and most importantly, they went to the museum multiple times. The ability to allow people multiple entries to their museum for no extra cost is a serious Smithsonian asset and means they can do things that might flop in other places. Would people enjoy “Murder at the Met” or “Soundscapes” if they couldn’t complete it in one visit and had to go back (and pay admission) a second or third time? The Smithsonian used this asset to its peak advantage! Just like the Met used their top-notch artists and the DeCordova used their free and unfettered space. Did each of these places use other internal resources in their games? Absolutely, but I think these are the ones that really made their games something to remember and write about years later. I could name a million more just in organizations that I personally work with who create simple but great game experiences for visitors just by playing to their strengths. The Joslyn Museum of Art used their connections with a local middle school to have kids build game content with “iArt for Kids by Kids”. The Quartermaster Museum in Fort Lee, VA, uses their museum games as part of soldier training. The Artlab at the Smithsonian has their teens build games to help the wayward tourists who are ALWAYS stumbling into the Artlab space. These resources were not money or talent, they were just aspects of the local communities and smart educators who knew how to best leverage these communities. The types of unique capacity and resources for each community are endless. The possibilities and ways to create that ideal experience for just your visitors are also endless. 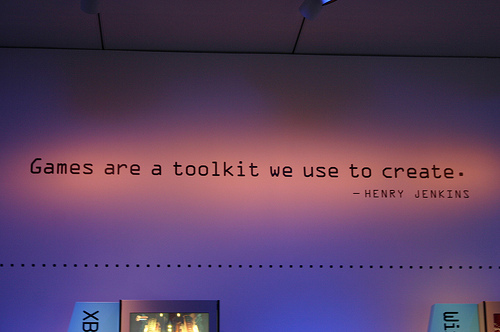 So go forth, gamebuilders, and build the perfect experience…not the perfect game. And how to give users that perfect experience will largely depend on what you have existing right now, this moment in your own museum toolbox. Kellian Adams is the Co-Founder and Mastermind behind Green Door Labs, a game design consulting firm based in the Boston area. In addition to working on projects like “Murder at the Met” and “ArtLab,” she also spends some time discussing games, museums, and much more over on Twitter. Find out more about Kellian at @Museumninja. Photo by Julian Stallabrass via Flickr. Photo by observista via Flickr. Armed with a skeleton of information what can really be discerned? A picture may be worth a thousand words, but it doesn’t speak them. Visuals alone cannot tell you if it’s representative of a wider trend or an example of a patron’s obscure and/or hidden desires. What about those self-made movements known at the time? A group of artists working towards a particular end, how do we make sense of these with no context? The buzz around the re-hang felt like those who were excited already had sound art knowledge, both professionally and academically. I’m interested in the ways museums and national galleries accommodate their audience—what role they play in society—and I can’t help but feel that without prior knowledge or an active interest, I’d come away from the new hang with a lot more questions than answers. Theorizing doesn’t dispute that art objects are themselves “primary data,” it simply draws a bigger picture (pardon the pun) to understand it as one part of a whole. On their own, the images cannot account for why, as Dorment later mentions, half the 19th century is squeezed into one gallery, as if Victorians had grown tired at the very idea of commissioning, painting and buying art altogether. After years of mediocrity—if not in actuality, then in the minds of many—it’d be great if the Tate Britain re-hang did “explode into view…like a walk through Britain itself,” but when there are so many different ways to read a work of art, surely a national collection displaying British heritage in art should guide its audience if nothing else. Art is all about making you think, and although not everything can be answered, isn’t there some sense of duty to ensure all visitors have free and easy access to this information? If this were to happen, then, as Art History News points out, providing the finer details of some works would create an interesting narrative that would otherwise be lost. For example, instead of tacking a Van Eyck on towards the end of a gallery with no indication of his important role in the development of British portraiture, some background could illuminate his influence on his contemporaries. Among all the positive critical response, there was finally a review that spoke of what there was, rather than what there was not, in the re-hang. In a much more muted tone, the Guardian notes that the new hang has taken a “middle course,” with short explanations widening historical and political issues. Less radical and more a new way to engage art with its audience? 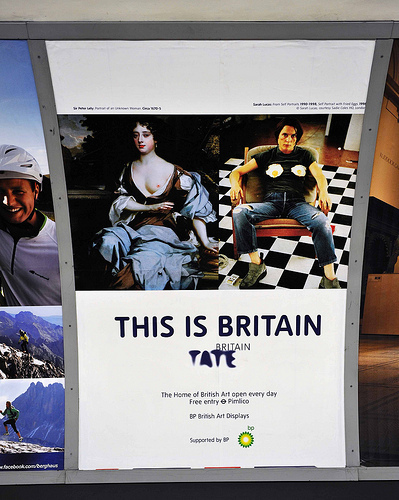 Maybe, but as Grumpy Art Historian asks, if the Tate’s Director, Penelope Curtis, and its Head of Displays, Chris Stephens, feel traditional methods of display are outdated why not adapt to compliment and promote newer ideas? Photo by alh1 via Flickr. The opportunity this shake-up has afforded hasn’t been promising so far: little information in the brochure, some sort of paid app/audio guide system and no clear means for gallery attendants to engage visitors with the tablets that have replaced their folder references. If this is the brave new world of the digital age in a museum setting, it needs a little work. It also raises some important questions: Has the information simply been transferred to digital? Will there be other ways to explore the collection, perhaps similar to the Google Art Project with hi-res close-ups? What about those who for whatever reason aren’t interested in getting involved with technology? There’s the role of the curator to consider too. If everything is to be discovered “surfing,” this new display and the dismissal of three of the historical curatorial team last spring makes for a slightly alarming prospect. This may have more to do with the fact that over the half galleries in the re-hang are dedicated to the 20th Century—leaving the remaining half for the preceding 300 years of British art—although considering the specialisations of both Curtis and Stephens this is unsurprising. 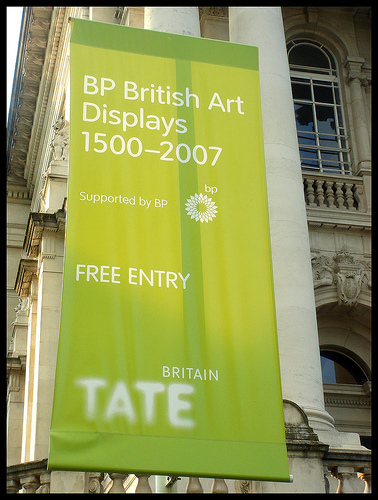 You might ponder, as Bendor Grosvenor does, what is Tate Modern for? To which my answer would be, international modern and contemporary art mostly, which is probably one of the reasons it is seen as the more suave of the two Tates. 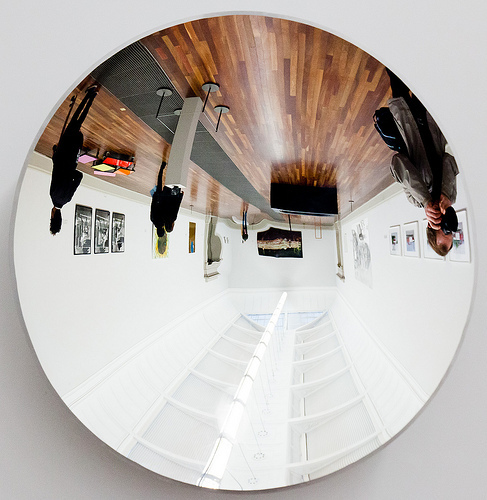 Have you been to Tate Britain’s new re-hang? What do you think? Have you visited other galleries and museums with a similar display philosophy? What works and what doesn’t? We’d love to hear from you in the comments below. Currently residing in Paris, Isobel is an art history graduate with a serious case of wanderlust. Interested in cross-cultural relations, cultural heritage and the social role of museums, she’s looking forward to continuing her studies come September and getting to see the re-hang for herself. Find her on Twitter at @isobelkwc.